Two generations of Athearns, Simon and father, Jim. That’s what Simon Athearn and his wife, Robyn, are envisioning for their first spring garden next year in their new house in West Tisbury. The newlyweds are moving into Simon’s great-uncle Leonard’s house off New Lane in the next few months after purchasing it from Simon’s family. But the roses won’t be the only things they will tend. With the house, Simon also bought the abutting 21 acres of farmland that his family’s business, Morning Glory Farm, has used for hay and various vegetable crops since the 1990s. And now with a unique conservation restriction, the farmhouse and farmland will remain in the Athearn family forever. The Athearns hope the restriction will be a model for other Vineyard farmers and owners of farmland. 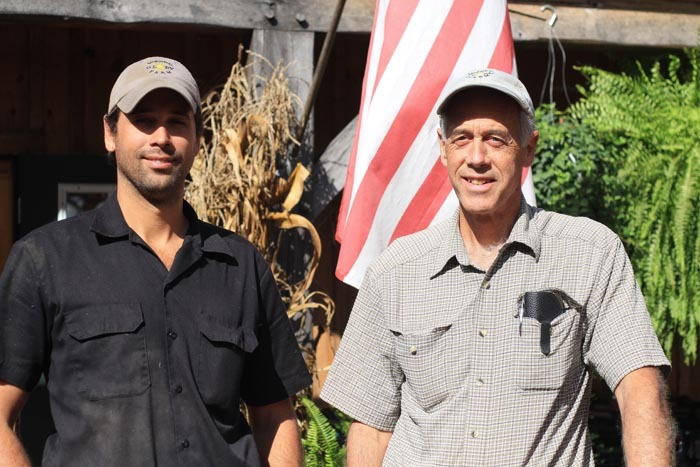 “You can rent farmland here and there, but to live on the farmland makes such a big difference,” said Jim Athearn sitting next to his son Simon at the Edgartown farmstand this week. “[If the farmer lives on the property], anything you do there can be done better, and if you want to have animal agriculture it’s very, very important. It’s also important for the family lifestyle, it’s just so key to living on the land,” the senior Mr. Athearn said. 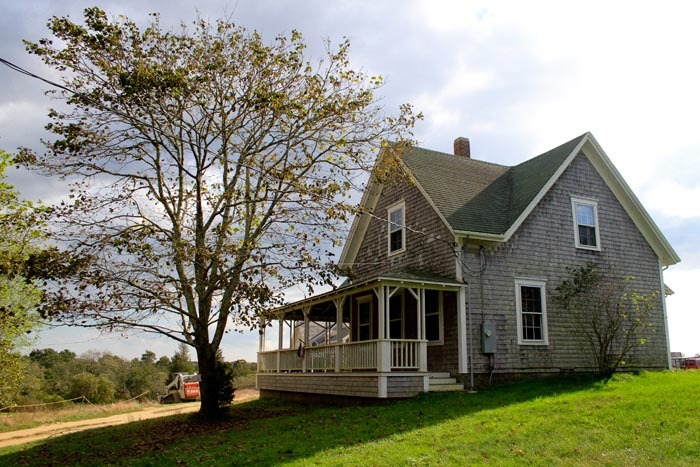 Held by the Martha’s Vineyard Land Bank, the conservation restriction the Athearns crafted for Simon and Robyn’s farm not only restricts the land to agricultural use but requires that the land be actively farmed. If the land is not being farmed, the land bank has the right to rent it out for farming purposes. The restriction also permanently caps the value of the farmland at a low rate; if the land is ever sold it must be sold at the market value of cropland. The land bank has a right of first refusal to buy the farmland back at this low rate. The Athearns have also created the option of a charitable use lot; they have the right to subdivide a four-acre parcel on the westerly portion of the land and sell it for conservation use, but again at cropland value. There is also a land bank trail system in the area and the conservation restriction allows the land bank to connect it to a larger trail system in the future. Leonard Athearn died in 2005 and Jim Athearn and his three siblings inherited the house and surrounding land. In 2006 the land bank bought a conservation restriction on the property for $1.2 million. But the extra restrictions were not added until this year. The added restrictions also include limitations on the resale of the house, which dates to 1878 where another patron Vineyard family and Athearn relative, the Looks, once lived. If Simon decides to sell the house he must first offer it to a family member, including his children, parents, siblings, or any other descendant of Elmer and Elizabeth Athearn, his great-uncle and aunt. He said the farmland, currently used for hay and different vegetable crops in rotation, will remain the same. He plans to lease the land at a “family-agreed-upon rate” back to Morning Glory Farm, although he also has the option to either start his own business or rent the land to another farmer. “It’s productive, it’s good soil, it’s a really good location,” Simon Athearn said. Meanwhile, in an ongoing move to turn the farm over to their children, Jim and Debbie Athearn will begin selling shares of the Morning Glory Farm corporation to sons Simon and Daniel over a period of time in the years ahead. Simon and Daniel have begun to take over much of the day-to-day farm operations, although Jim and Debbie are still very much involved. “Families can restore the family value of providing a place for their kids to live and not have to think of anything like a retirement fund, and in the long run you could think more about these kinds of transfers,” Jim Athearn said. Simon said the purchase and restrictions cement his stake in a long family tradition of farming. Land bank executive director James Lengyel called the restrictions innovative.